My latest trip to Ennerdale Water, in the Lake District, has yielded its usual crop of spectacular views and intriguing questions (see “Reflections from Ennerdale’s far side”). This time, my curiosity was piqued by lush growths of green algae at several locations around the lake shore. The knee-jerk reaction to such growths is that they indicate nutrient enrichment but I am always sceptical of this explanation, as lush green growth are a common sight in spring (see “The intricate ecology of green slime …”) and these often disappear within a month or two of appearing. Two points of interest: first, the lake seems to be lagging behind the River Ehen, which flows out of Ennerdale Water. 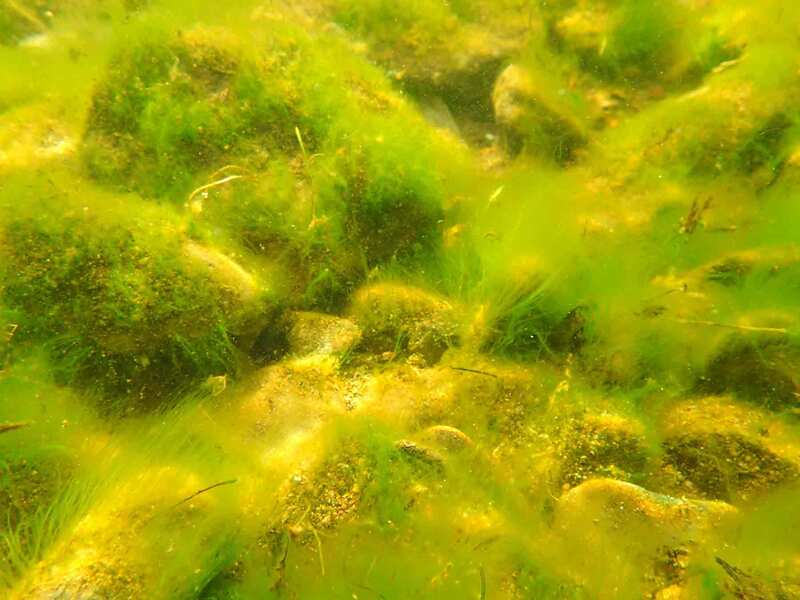 We often see these lush growths of algae on the river bed in winter but by this time of year the mass of algae there is lower than we saw in the lake littoral. Second, the lake bed looks far worse (see photograph below, from the north-west corner of the lake) than the actual biomass suggests. Filamentous algae (Ulothrix aequalis) smothering cobble-sized stones in the littoral zone of Ennerdale Water, April 2017. Under the microscope, this revealed itself to be unbranched filaments of a green algae, whose cells each contained a single band-shaped chloroplast lapping around most of the perimeter. This is Ulothrix aequalis, a relative of Ulothrix zonata, which I wrote about a few times last year (see link above). Like U. zonata, this species is very slimy to the touch and, I suspect, the payload of mucilage adds to the buoyancy of the organism and means that we look down on a fine mesh of filaments which trap light and add to the unsightly appearance of the lake bed at this point. That this part of the lake shore is close to a tributary stream draining some improved pasture triggers some suspicions of agricultural run-off fuelling the algal growths but, looking back at my notebook, I see that the lake bed was almost clear of green algae when we visited this location in July last year. I suspect that a return visit this summer would also show a clean river bed. Appearances can often be misleading (see “The camera never lies?”). Ulothrix aequalis from the littoral zone of Ennerdale Water, April 2017. Scale bar: 10 micrometres (= 1/100th of a millimetre). This was not the only site that we visited that had conspicuous growths of green algae, though the mass of algae was greatest here. All of the sites at the western end had these growths (see “A lake of two halves” for an explanation of geological differences within the lake) but, curiously, the genus of alga that we found differed from site to site. 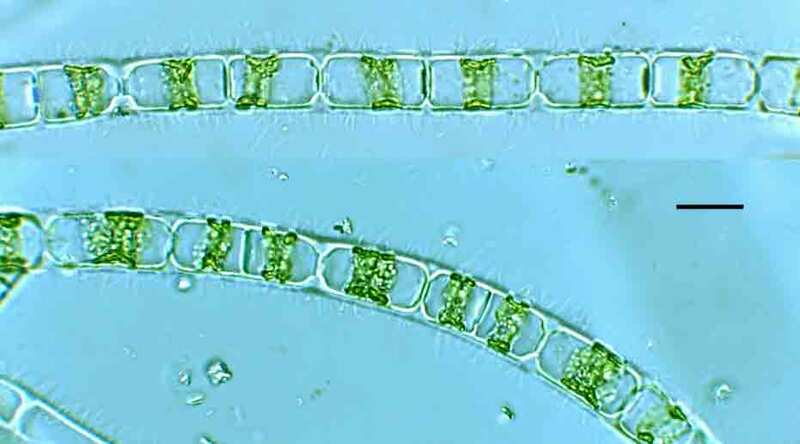 In addition to Ulothrix aequalis in this corner of the lake, we found Mougeotia on the south side and Spirogyra close to the outfall. This diversity of forms is, itself, intriguing, and I have never read a convincing explanation of what environmental conditions favours each of these genera. I see both spatial and temporal patterns of green algae in the River Ehen too and, again, there is no satisfactory explanation for why the species I find can differ along short distances of the river and between monthly visits. This entry was posted in Ennerdale and the River Ehen and tagged algae, Cumbria, Ennerdale Water, Lake district, Ulothrix. Bookmark the permalink.